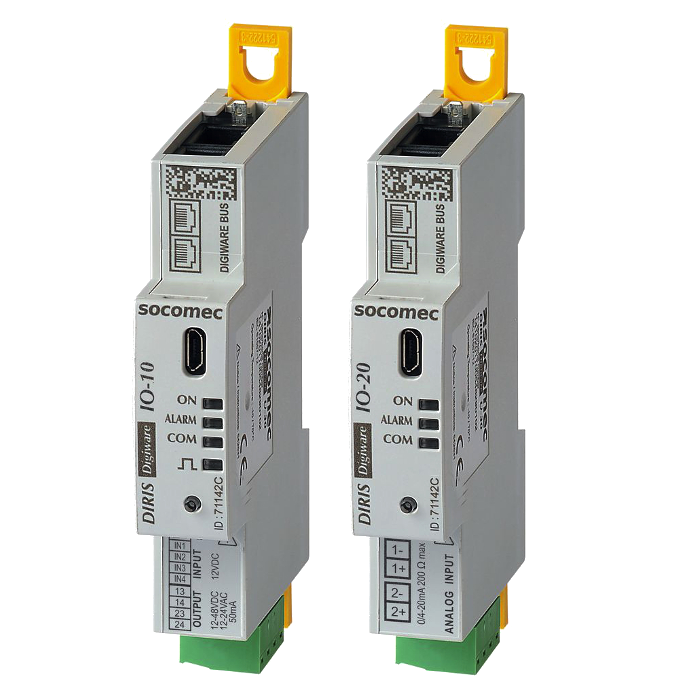 Add versatility to your power monitoring system such as breaker status monitoring, temperature monitoring, and more. DIRIS Digiware IO modules give more versatility to the Digiware system. DIRIS Digiware IO-10 modules have 4 digital inputs and 2 digital outputs. The digital inputs can be used to monitor the status of third-party devices such as the physical position of a protective device (ON/OFF, trip), to collect pulses from multi-fluid meters. The digital outputs allow the remote control of protective devices by sending a binary output signal. DIRIS Digiware IO-20 modules have 2 analog inputs used to collect data from analog sensors (pressure, humidity, temperature...).